The reNEWed HOPE breakfast benefit will be held Friday, April 26 benefiting New Hope Center of Paris. This event is a great opportunity to learn more about what New Hope Center is doing here in our community. New Hope Center of Paris mission is to provide a home of hope and direction while instilling self-respect and dignity to those in need. New Hope Center of Paris transitional housing program works with men woman and families who are experiencing homelessness. New Hope Center also has other programs that benefit the community such as Eviction Prevention and the Batterer Intervention Prevention Program (BIPP). This is the second year for the event and the agency hopes to raise $25,000 for the transitional housing program. The agency is excited that Joseph B. Vought will be the keynote speaker at this year’s event. 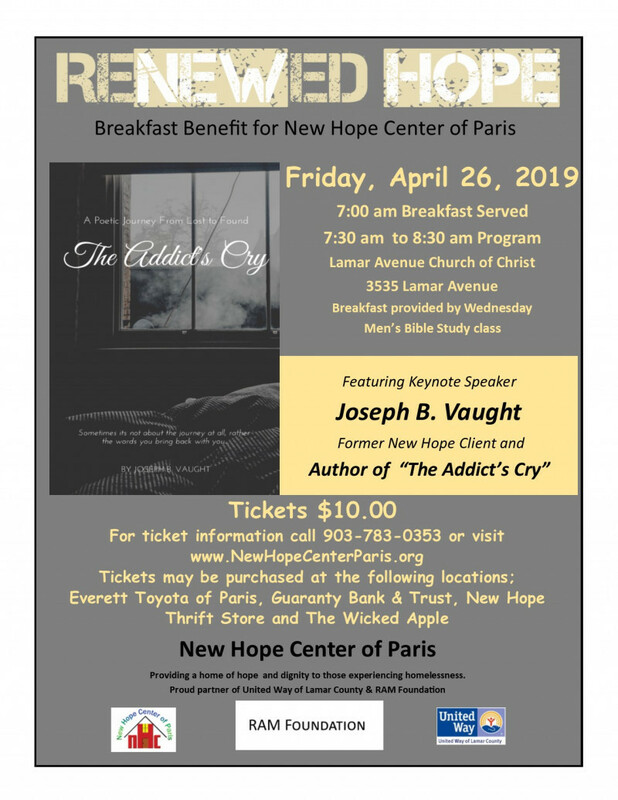 Joseph B. Vaught has recently released his book of poetry “An Addict’sCry” and is looking to have a book signing soon at The Blind Pig here in Paris. Mr. Vaught is also a past client of the New Hope Center of Paris. You will not want to miss hearing his testimony. The event is being held at the Lamar Avenue Church of Christ on Friday, April 26. The doors will open at 7:00 am and the program will begin at 7:30 am and conclude at 8:30. Tickets at $10.00 and can be purchased Everett Toyota of Paris, Guaranty Bond Bank & Trust, The Wicked Apple, New Hope Thrift Store or online at www.newhopecenterparis.org. Breakfast is being provided by the Lamar Avenue Church of Christ Wednesday Men’s Bible Study. The Downtown Food Pantry is furnishing the eggs and milk and Paris Coffee Company will be providing coffee for this year’s event. “We would not be able to hold this event without the kindness of other’s, we greatly appreciate the hard work being put into this event to make it a success” Tanteta Scott, Executive Director. For information about services at New Hope Center, please call (903) 783-0353 or visit their website at www.newhopecenterparis.org.